“Día de los Muertos” (Day of the Dead) is approaching and for some people this may be a difficult time of the year due to the lack of a proper resolution regarding the departure of their love ones from this world. It can be challenging and painful for some to remember that their family members are not here anymore. Some individuals may still have the need to grieve and mourn their love ones especially if they did not have the opportunity to attend their funerals. Anxiety and depression may be experienced by some. On the other hand, other people may see this celebration as an opportunity to come to a peace about their losses. Growing up in Mexico City, “Día de los Muertos” was an exciting holiday (on November 1st deceased children are remembered, and the following day is adults turn) because we used to carve pumpkins, placed a candle inside of them, and went into the neighborhood to ask for money, “un veinte a la calavera”(a coin for the skull) is what we used to say (the equivalent to trick or treat). Besides that and the special treats including “pan de muerto” (special bread), and “calaveritas de dulce y chocolate” (small skulls made of candy and chocolate) was all children cared for. Children were not fully aware of their parent’s or relatives’ emotional pain and distress. Many Mexican people express their love, respect, and honor to their deceased family by preparing their favorite food and drinks, and by putting them on tables along with flowers, candles, and pictures; this is a way to keep them alive in their minds. 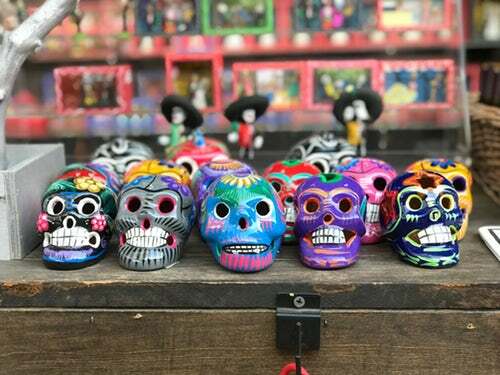 Some of them go to the cemetery and on the tombs, they put deceased’s favorite food, alcoholic drinks, flowers, candles, and even some bring a mariachi band to sing their dead’s favorite songs. They talk to them as if they were right there listening. For some, this celebration may signify a way to be in peace with their deceased specially if they did not have the opportunity to do so when they were alive. In some cases, people may be afraid of the unknown or the death itself, and may also believe that through following this rituals and celebration, they can save their love ones from eternal punishment. Día de los Muertos also offers individuals the opportunity to openly process their losses without feeling criticized or rejected; expressing unresolved emotions are encouraged and understood, thus a sense of relief may be experienced. By remembering their love ones people may feel a sense of connection, however, going through a process of grieving and mourning with the help of professional therapists is encouraged for those who have experienced not only traumatic losses, but those who feel distressed and depressed for the departure of their love ones. Khesed Wellness profoundly understands people’s emotional struggles, and offers affordable professional counseling services for those who are dealing not only with grief and loss, but trauma, anxiety, depression, addictions, and more. Our therapists are more than happy to help you with kindness, love, and respect. Please visit our website at khesedwellness.com for more information and locations near you. Spanish speaking services are also now available. El Día de los Muertos se acerca y para algunas personas ésto puede ser un tiempo difícil debido a la falta de un proceso apropiado de resolución con respecto a la partida de sus seres queridos de éste mundo. Para algunas personas puede ser desafiente y doloroso el saber que sus seres queridos ya no estan aquí. Algunos individuos pueden tener todavia la necesidad de pasar por el procesos de duelo especialmente si no tuvieron la oportunidad de asistir al funeral de sus familiares. Algunos pudieran estar experimentando ansiedad y depresión. Por otro lado, otras personas pudieran ver esta celebración como una oportunidad para ponerse en paz con la pérdida de sus familiares. Habiendo crecido en la Ciudad de México, el Día de los Muertos era una festividad con mucha emoción (el 1o. de Noviembre los niños que han muerto son recordados y el siguiente día es el turno de los adultos) porque le dabamos figura a nuestra calabaza, le colocabamos una vela adentro y nos ibamos a las casa de los vecinos a pedirles un veinte a la calavera. A los niños lo único que nos importaba era ir a pedir dinero con nuestra calavera y la comida, incluyendo el pan de muerto y las calaveritas de dulce y chocolate. Los niños no estan completamente conscientes de la agonía y dolor emocional de sus papás o familiares por la pérdida de sus seres queridos. Muchos mexicanos expresan su amor, respeto, y honor hacia sus familiares muertos al preparar su comida y bebidas favoritas, y colocando flores y fotos; esta es una manera de mantenerlos vivos en su mente. Algunas personas van al cementerio y colocan sobre la tumba de sus seres queridos su comida favorita, bebidas alcholicas, flores, e inlcuso algunos llevan un mariachi para que canten las canciones que le gustaban al difunto. Le hablan a sus muertos como si estuvieran ahí escuchando. Para algunos, esta celebración puede significar una manera de estar en paz con el difunto especialmente si no tuvieron la oportunidad de hacerlo en vida. En algunos casos, la gente puede tener temor a los desconocido o a la muerte misma, y creen que al hacer estos rituales y celebraciones pueden salvar a sus seres queridos del castigo eterno. El Día de los Muertos es una oportunidad para algunas personas de procesar abiertamente sus pérdidas sin sentirse criticados o rechazados; también son animados a expresar las emociones no resueltas de tal manera que puedan experimentar alivio. Al recordar a sus seres queridos, las personas pudieran sentir una sensación de conección con ellos, sin embargo, para aquellos que han experimentado una pérdida traumatica, o para aquellos que se sienten atormentados o depresivos por la partida de sus seres queridos es muy recomedable que pasen por un proceso de duelo con la ayuda de terapistas profesionales. Francisca Alvarez RP, Apprentice is earning her Master of Arts in Clinical Mental Health Counseling at Denver Seminary. She obtained her Bachelor of Science in Economy from Metropolitan Autonomous University in Mexico, City. She is Prepare/Enrich certified in working with couples to heal and strengthen their relationship. Francisca is passionate in helping people to become healthy in a holistic way and is willing to incorporate faith into sessions if clients bring this subject up. She is open in serving the Hispanic community including teenagers, young adults, adults, and couples. Francisca was born and raised in Mexico State and moved to Colorado two decades ago. She spends some of her free time traveling with her husband and their teenage daughter, and also enjoys watching movies, and eating Mexican and Italian food with family and friends.